I was playing video games online with my group of gamer friends. When they heard me yelling on the Xbox live mic and wanted to see my friend who had epically came back to win the game. The idea of watching friends play online came from me losing epically. This is future thinking project for second screen experience with NCAA Football 2014/2015. My goal was to design a second screen experience that allowed gamers to connect with their friends and online dynasties. Over the span of three days I did user research, persona development, wire-framing, user testing and visual development. A group of friends play NCAA regularly online in game mode called online dynasty. The friends want to watch each other play. For this step I observed the user in order to gain insight on how they both watch sports and play sports based video games. For this step I interviewed people about there experiences with video games and tablets. The second screen experience is fairly new so I focused on asking their experience with tablets in general and there gaming habitats. For this stage I looked at the competitors and the current market that this product would live in. 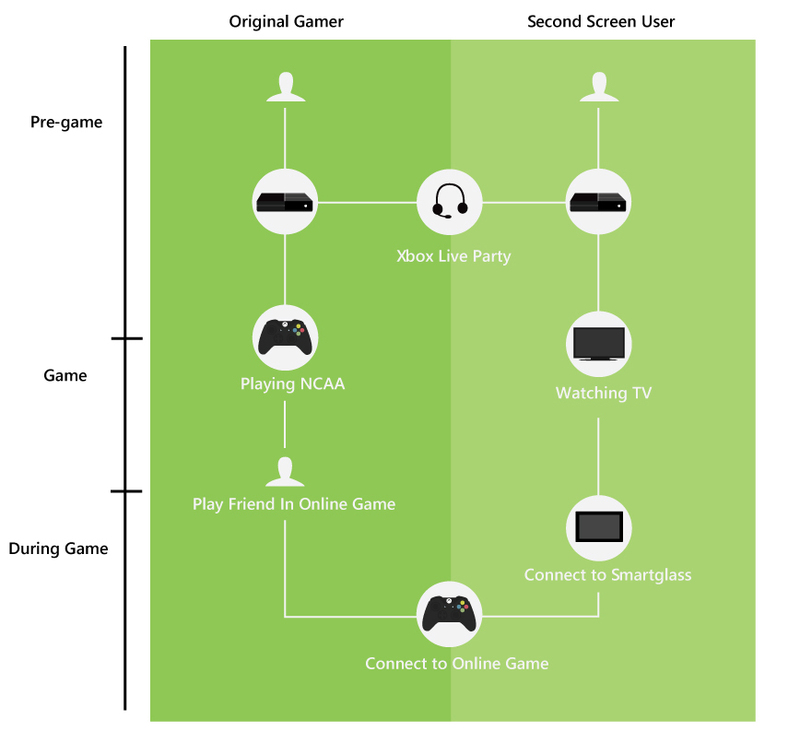 I first looked at Xbox Smart Glass and concluded that NCAA app should live on it's own. I then looked at the Xbox One fantasy football application and concluded that there should be side menu they is draggable in screen. I finally looked at the second screen experience for the Walking Dead and concluded that text heavy applications wouldn't be the best experience because its a secondary screen and the visuals are legs of these products. The ESPN app is also heavy in text when the content app is more important in a second screen experience because its not the main focus of the user rather the main screen. Current Second Screen experiences are too text heavy. Based on the data I collected I created personas below. Eric is Senior in Highschool who is on Crew team and has passion for sports. 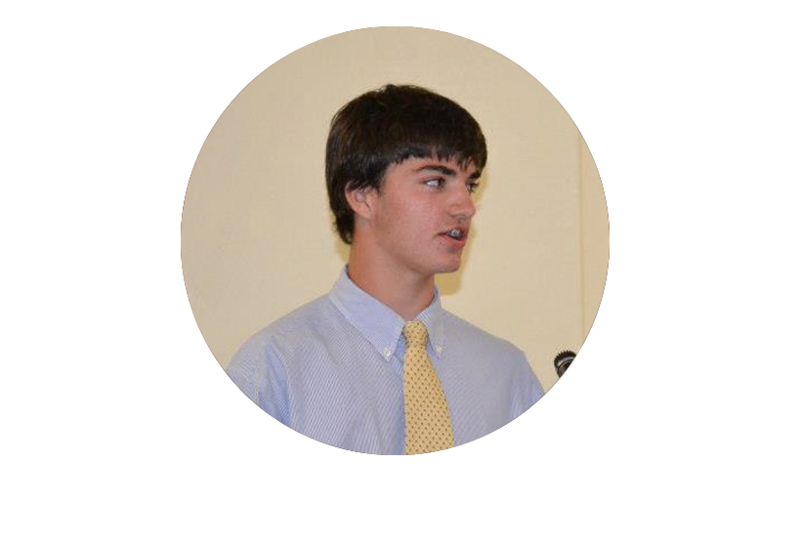 Eric games between 18-24 hours a week and tends to play mostly sports with occasional Call of Duty multiplayer match. Ian is Freshmen in College who also has a passion for sports and loves supporting his college team. Ian games between 8-19 hours a week depending on how long the online dynasty takes. Will is a sophomore in Highschool and has joined his older brother Ed’s online dynasty. Will is also on the Highschool rowing team. Will games between 12-30 hours of gaming a week. A group of friends play NCAA regularly online in game mode called online dynasty. Ian happens to be playing Eric which directly affects Will because Eric is one game ahead of Will in the West side of the conference. Ian has been leading Eric throughout the game but in the 4th quarter Eric has made miraculous comeback. Will turns on his tablet to watch the video game because he’s in the middle of watching OSU vs Michigan on the TV. Will normally wouldn't be able to see this but only hear the reactions of players playing the game because they are talking about the game through their Xbox live mics. With the second screen experience Will now be able to see the Fourth down conversion on the goal-line that determines this game. My initial sketches of the interfaces & ideation of different options. A new interactive entertainment platform for NCAA football the utilizes Xbox Smart Glass technology.